A General Equilibrium Model of Family Remittances to Cuba: Or Why Is It So Expensive to Send Money to the Island? The question of remittances from persons of Cuban descent living outside of Cuba to their relatives on the Island is one of the most contentious in the Cuban- American community. Even if the economic and political impact on Cuba of remittances were not significant—and I believe they are—the important role they play in the international debate on policy toward the Island would make them worthy of study. Much of the debate on remittances to Cuba revolves around their magnitude. In the 1990s the Cuban government resumed publishing balance of payments statistics (Pérez-López (2000)). The category net current transfers, which includes remittances, showed a substantial increase from $263 million in 1993 to $828 million in 1999 (Morris (2000)). More recently the figure of one billion dollars has been bandied about. These numbers are often used as measures of remittances. To see the importance of these magnitudes, consider that gross tourism earnings for 1999 were $1,901 million (Morris (2000)). Since only about 30% of this is net hard currency earnings, that would make remittances the single biggest source of hard currency in 1999. These large magnitudes have been used by opponents of the U.S. embargo on trade with Cuba to argue in favor of lifting sanctions (Betancourt (2000)). The argument has been that the Cuban-American community is being hypocritical by opposing the lifting of the embargo, while at the same time providing financial support to the Cuban regime to the tune of upwards of $800 million per annum. This is a specious argument, for there is nothing contradictory about being in favor of maintaining the embargo and sending money to one’s relatives in Cuba. This is an example of a situation where individual maximizing behavior (on the part of opponents of the embargo) will likely not lead to the optimal choice for the group. Each individual Cuban-American will see his or her remittances as helping his relatives directly, while having an insignificant effect on the regime’s survival. We have here an example of the “tragedy of the commons,” where individual action leads to excessive transfers to Cuba. The argument would be analogous to saying that because I contribute to air pollution by driving a car I cannot be in favor of tougher air quality standards. An alternative to the balance of payment figures can be found in Díaz-Briquets (1994). His approach is to use U.S. Census data on persons of Cuban descent to essentially simulate levels of remittances based on a range of parameter assumptions. Referring to 1994, he opines that “remittances do not exceed $300 to $400 million annually,” numbers that are consistent with the figure mentioned above based on the balance of payments statistics for 1993. Such simulations are useful in checking the plausibility of a given estimate, but not to obtain an accurate estimate of remittances, since the results are sensitive to the assumptions made. A good example is Díaz-Briquets’ assumption, in what he considers his more reasonable estimates, that U.S.-born persons of Cuban descent do not remit money to their relatives in Cuba. While this may be true, they may provide financial support to their older Cuban-born relatives in the United States, freeing up the latter’s resources to send to relatives on the Island. An older Cuban who appears to have meager resources of his own, may send a large fraction of those resources to relatives in Cuba if he is supported in the United States by a younger relative. Ignoring the resources of those born in the U.S., therefore, may significantly underestimate remittances. Persons with strong prior beliefs are unlikely to be persuaded by simulated estimates supporting a different view. The best way to estimate remittances would appear to be to conduct a survey for this purpose among persons of Cuban descent living in the United States.3 It would be very valuable to be able to conduct such a survey soon so as to be able to evaluate the impact of September 11 and the U.S. recession before time blurs people’s memories of what they remitted before these events. The lack of accurate numbers on remittances to Cuba precludes doing any econometric work on the subject at this time. So instead I am focusing on exploring a specific qualitative feature of remittances to Cuba: why is it so expensive to send money to the Island? The reader may think that the answer to this question is obvious: the Cuban government is in a monopolistic position and charges monopoly prices to remit money to Cuba. I will argue below that this argument is too simplistic. It ignores the interrelationship between remittances and purchases at dollar stores. The real question is not why the Cuban government should charge monopoly prices, but why its monopoly prices should take the form that they do. More specifically, I will be asking under what circumstances does it make sense for the Cuban government to charge high prices for both remittances and for goods sold at dollar stores. In doing this, the government is essentially treating dollars from remittances differently from other sources of dollars (remittance fees on top of high prices at dollar stores), and it is not evident why it would want to do so. To address this question I develop below a model of remittances to Cuba that I hope may serve as the starting point of a research program to accurately measure remittances to Cuba, to analyze their place in Cuban policies, and to investigate their impact on Cuba’s economy and on a future transition. First, however, I provide a brief discussion of the role that remittances played in the process of economic “reform” in Cuba following the collapse of the Soviet Union and a critique of the simple monopoly pricing explanation for why sending money to Cuba is so expensive. These first two sections provide motivation for the model. I conclude with a brief summary and some suggestions for future work. Remittances to Cuba obviously provide the regime with much-needed hard currency. The regime “captures” remittances through the direct fees it charges for sending money to Cuba and through high prices for goods at dollar stores. This clear benefit to the government raises the question of why have remittances not always been allowed or encouraged. There must be a downside to remittances, and the tradeoff between the beneficial and harmful effects of remittances to the Cuban regime must have been altered after 1989. One clear undesirable effect of remittances from the point of view of the Cuban government is that they can lead to severe skewing of the distribution of income on the Island. Many Cubans either have no relatives in the United States or are not on sufficiently good terms to receive remittances from them. The problem is made worse by the fact that the recipients of remittances tend to be those persons most hostile to the regime, and that remittances reduce reliance on the government. Such considerations were the major reason leading Betancourt (2000) to argue that remittances could not possibly be as high as $800 million. These considerations would lead to the following interpretation of the Cuban government’s policy change concerning remittances following the collapse of the Soviet Union. When Cuba was receiving Soviet subsidies, high levels of remittances were not worth the social and political problems they would cause. This cost-benefit calculation was reversed by the end of Soviet subsidies. According to official figures, Cuba’s real GDP fell 35% during 1990-93 from an already low level. The relative and absolute importance of remittances naturally rose, making it acceptable to incur the accompanying risks in allowing and encouraging them. The change in remittances policy was closely connected to dollarization. Allowing the dollar to circulate not only encouraged remittances, but also created a mechanism—the dollar stores—to capture them (Locay (1998)). The Cuban government also imposed high tariff barriers on goods brought into Cuba. Prior to dollarization, remittances often took the form of this sort of in-kind transfer. The objective of these high tariffs seems not to have been the raising of revenue, but rather to force remittances to be in dollars. Again, this is consistent with the downsides to remittances discussed above. The benefit of in-kind transfers accrue entirely to the recipient, but part of the benefit of dollar transfers is captured by the government through high prices at dollar stores (Locay (1998)). Sending money to Cuba through legal channels is much costlier than sending money to other countries in Latin America. Wiring funds abroad is probably characterized by a small fixed cost and zero (or very close to zero) marginal cost. I contacted two local companies in Miami that wire funds to Nicaragua and Colombia, and their pricing policies reflect this hypothesized cost structure. Both charged a small fee to send $100, and no additional fee for larger amounts. I contacted two companies that send money to Cuba, and both quoted me higher fees for a $100 remittance. Furthermore, the fee increased with the amount sent. To send $500 to Cuba both companies charged around 10% ($50 and $52). Higher fees for Cuba are common for other services. A recent ad for overseas telephone service to 23 cities or countries in Latin America, excluding Cuba, showed an average rate of $0.21 per minute. The charge for Cuba was $0.95 per minute. This would appear to be standard monopoly pricing. Let us consider the case of remittances more formally. To keep things simple let us assume that the marginal cost is indeed zero. Let r be the rate charged per dollar, and define X(r) to be the amount remitted as a function of r. X is what is received in Cuba, and (1+r)X is the total amount of money spent. X(r) is the demand to remit, and consequently it is a decreasing function of r. If the Cuban government behaves as a simple monopolist interested in maximizing profits, it will set r so as to maximize r X(r). This occurs where the demand elasticity equals -1, which apparently is around r = 0.10. This is the standard textbook solution for a monopolist to maximize profit when marginal cost is zero, i.e., maximize revenue. Notice that not only does this explain why it is expensive to remit money to Cuba, but also why the expense rises with the amount sent. At best, however, this simple explanation has to be incomplete. The reason is that the Cuban government also sets prices at dollar stores. In setting r the Cuban government will want to take into account that remittances eventually find their way to dollar stores where they are captured through high prices. Could the government do better, for example, by setting r equal to zero, encouraging more remittances, and taking its profits through high prices at dollar stores? The Cuban government’s objective is to maximize (2) with respect to r and P. Inspection of (2), however, shows an immediate problem. Since remittances are assumed to be insensitive to the price at dollar stores, P, it is optimal for the government to set that price infinitely high and sell an infinitesimally small quantity.4 Clearly we need to make purchases from dollar stores sensitive to the price at such stores. One way to do that is to allow remittances to depend on P, and the best way to do that is to formally model the decision of how much to remit. I turn to that in the next section. It is not difficult to construct an ad hoc model that can “account” for a positive remittance fee. One can assume, for example, that there are demand functions for remittances and sales at dollar stores that are functions of r and P and that have the necessary elasticities. Such a model would be of little or no value, however, as it would simply embellish with a theoretical apparatus what we already know: that it is expensive to send money to Cuba and that dollar store prices are high. It would add nothing to our understanding of why this is so. Furthermore, such a model would likely not be useful in explaining other features of remittances. The model I construct in this section will therefore be based on full rationality. It is a model where each group of decision makers is assumed to be composed of identical individuals. Each group of identical persons is represented by a representative agent. The model is a general equilibrium one, in the sense that it includes the decisions of individuals or households in Cuba and the United States, and the Cuban government, and all three groups are connected through their budget constraints. Such general equilibrium, rational agent models tend to be complex, and this one is no exception, despite my efforts to keep it simple. Before developing the full model let us begin with a simpler version that will illustrate some of the difficulties of deriving the desired results. The solution to the representative Cuban-Americans problem is depicted in Figure 1. The “*” on a variable indicates the optimal value. Figure 1 makes it clear that what the Cuban-American is choosing is his relative’s consumption level. This means that changes in other sources of income will to some extent be offset by remittances. From this it follows that remittances cause the government to lose some of its control over the consumption level, i.e., wellbeing, of its subjects. where subscripts represent partial derivatives. 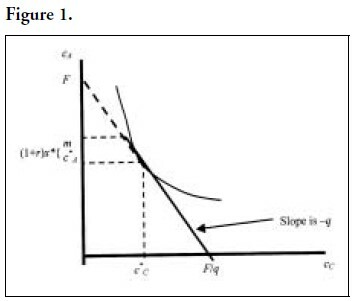 Let us begin by interpreting the first equation, the marginal profit of the remittance fee. Increasing the remittance fee, r, raises revenue directly depending on the amount being remitted. This is captured by the term X in the first equation of (9). Revenue from remittances is reduced, however, because remittances fall, and because lower remittances translate into lower dollar store sales. This is somewhat offset by the cost savings from reduced sales. These combined effects are captured in the second term of the first equation, NP(q-1)cCq < 0. The second equation in (9), the marginal profit of the dollar store price, is more complicated to interpret, but the end result is that raising P has the added marginal benefit of increasing profit from non-remittance financed dollar store sales. Inspection of (9) shows that making remittances a function of P is not enough to obtain the result that r > 0. If there exists a finite solution for P, which means that HP=0, then Hr < 0. That is, it would be optimal to reduce r to its lowest possible value. It would actually be in the government’s interest to pay Cuban-Americans to remit funds to Cuba if that was possible. For an interior solution for r—this does not necessarily mean that r>0—it is required that Hr = 0, so that HP > 0. This implies that the dollar store price should be infinite. But even before the price at dollar stores becomes infinite Cuban-Americans would cease sending their relatives funds. 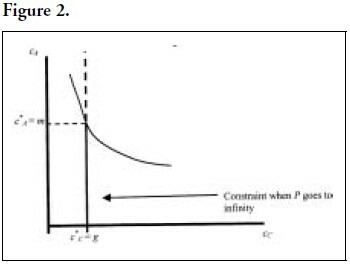 This can be seen by letting P go to infinity in Figure 1. The constraint faced with an infinite price and the choice made by the representative Cuban-American is depicted in Figure 2. As can be seen, the representative Cuban- American spends his entire income on himself. In the model presented above the government makes no distinction between a dollar raised through dollar stores and a dollar raised through the remittance fee. Since raising the dollar store price has the added benefit of generating profit from non-remittance financed dollar store sales, it is better to encourage remittances with a low fee (below zero if possible). I now develop a model based on the discussion in sections 1 and 2 that drops these assumptions. Suppose that there are three types of Cubans: those that receive remittances, those that have informal dollar earnings, and those that depend exclusively on the government for support. I assume that those who receive remittances do not also have other sources of dollars. This assumption is not important and is made simply to reduce the number of groups that have to be dealt with.6 Those who have informal dollar earnings are self-employed, so the government knows who they are. The government, however, does not distinguish between those who receive remittances and those who do not. As before, Cuban individuals have no choice problem to speak of. They simply spend at dollar stores what they receive in remittances or through self-employment. Notice that the demand for “real” remittances depends only on the full price, q, and not on the remittance fee and the price at dollar stores separately. where y = t/P is real per capita dollar earnings by those who have such earnings, and k=K/N. We can turn now to the government’s objective function. where v is an increasing, concave function, and a is a positive constant. Let us interpret the function given in (16): v(gO) is the support received per individual whose consumption comes completely from the government. This support increases with gO, but does so at a decreasing rate. To obtain the aggregate support from this group, v(gO) is weighted by the fraction of the population, (1-sT – sX), whose consumption comes completely from the government. The support received from an individual who receives remittances is given by v(gO +z) – az2. The support here has two parts. Individuals in this group have real consumption, (gO +z), which should have the same effect as gO. Remittances, however, have a separate effect, reflecting the fact that they do not come from the government and that they worsen the distribution of income. Once again the aggregate support from this group is weighted by the fraction of people that compose it.8 The support from the self-employed group is similar, except that the detrimental effect of dollar income, -a(gT +y – gO),2 depends on the income differential between them and those that receive all of their support from the government, rather than y. For the recipients of remittances z played both of these roles. Notice that the detrimental effects from dollar earnings also exist if the self-employed have the lower level of consumption. where l > 0 is a the Lagrange multiplier associated with the government’s budget constraint. It is the marginal support of income, i.e., how much more support can the government purchase with an additional dollar. The left hand side of the first equation in (17) has three interpretations. It is the marginal support from spending an additional dollar on those with self-employment dollar income. It is also the marginal support from an additional dollar of selfemployment income, or what amounts to the same thing, the marginal support from allowing those with self-employment dollar income to keep an additional dollar through lower prices at dollar stores. Notice that (17) requires that for any interior solution such marginal supports be positive. At the margin the government gains support from an additional dollar earned. The situation can be considerably different for remittances. The marginal support from remittances is given by the left hand side of the second equation in (17). Notice that this quantity may well be negative. Despite considerable symmetry in the treatment of informal dollar income and remittances, remittances can end up being a “bad” for the government at the margin. What accounts for the different treatment of these two sources of dollars in this model? The difference arises because the government can adjust its expenditures on those that earn dollars, but not on those that receive remittances. Those that work in the informal sector are assumed not to work for the government, and therefore they receive less from the government. Such an adjustment is not possible for the recipients of remittances. So at the margin remittances may well reduce political support (they are a “bad”), implying that the government will wish to discourage them relative to informal dollar earnings. If the government further increases the price at dollar stores it will reduce the real value of informal dollar earnings, which is equivalent to reducing the government’s income. Instead the government charges a direct remittance fee that is above marginal cost. Here, then, is a complete and consistent explanation. The parameter k in (18) corresponds to per capita GDP in purchasing power parity, which The World Factbook 2001 sets at $1700 for the year 2000. The fractions of persons receiving remittances and with informal dollar income I set at values that seemed reasonable to me, but I do not know if they are even approximately correct. I set dollar earnings at $450 per capita for persons with such income.9 Assuming a population of 11 million, this generates aggregate informal dollar earnings of $495 million, which is consistent with the balance of payments statistics cited previously. These parameter values generate a remittance fee (assuming a marginal cost of zero) of 11%, and a dollar price that is 55% above marginal cost. The remittance fee is close to the rates that I was quoted. I do not know what is the average markup at dollar stores. The implied aggregate remittances come to $413 million. The income (consumption) differential between someone receiving remittances and someone dependent completely on the government for support is $121. The income (consumption) differential between someone with informal dollar earnings and someone dependent completely on the government for support is only about $2. The difference gO – gT, which is essentially the average government salary, is $287.10 Finally, at the margin remittances are a “bad”, i.e., they reduce political support, but dollar earnings increase it. I have argued in this paper that the popular explanation for why it is expensive to remit money to Cuba —monopoly pricing on the part of the Cuban government—is incomplete because it ignores the interrelationship that exists between remittances and purchases at dollar stores. A rational monopolistic Cuban government would not ignore such connections in designing its pricing policies. I originally thought that a fairly simple model with fully rational decision-making could account for a positive remittance fee. The model I eventually developed, and that I have presented here, is surprisingly complicated. If a simpler rational general equilibrium model exists, I have not been able to discover it. The model in this paper built on the idea that resources that do not originate with the government, and that therefore the government does not directly control, can pose political problems for it. The government will, of course, try to capture and control those resources. But this it can do through the prices at dollar stores. To charge a remittance fee above marginal cost is to treat dollars from different sources differently. But why should the government wish to make such a distinction? The answer given here is that one fundamental difference between those receiving remittances and those earning dollars through employment in the informal tourist sector is that the government can identify and compensate the latter differently from the general population. People who work in the informal sector do not work for the government, so via government salaries those working in the informal sector will receive fewer resources from the government. The government can, at least to some extent, neutralize the politically harmful effects of dollar earnings. Essentially, dollar earnings can be turned into the government’s income. This is not possible with remittances. Because of their politically harmful effects that cannot be neutralized, the government will wish to raise the cost of remittances, which it does through a positive remittance fee. I hope the model will prove useful in exploring other aspects of remittances. As can be seen in the numerical example above, the model can be calibrated to generate reasonable numbers. With better estimates, a better calibration should be possible. In the future I would like to explore the implications of the elimination of the Soviet subsidies. The elimination of those subsidies would be modeled as a reduction in k. Some preliminary calculations with the example used above resulted in increased remittances. However, the end of Soviet subsidies was accompanied by other changes, such as dollarization and the legalization of self-employment, that I have not explicitly modeled here. In future work I would like to extend the model to be able to account for these other policy changes. Betancourt, Ernesto F., 2000. “Cuba’s Balance of Payments Gap, the Remittances Scam, Drug Trafficking and Money Laundering.” Cuba in Transition—Volume 10. Association for the Study of the Cuban Economy, Washington, D.C.
Hernández-Catá, Ernesto, 2000. “The Fall and Recovery of the Cuban Economy in the 1990s: Mirage or Reality.” Cuba in Transition—Volume 10. Association for the Study of the Cuban Economy, Washington, D.C.
Morris, Emily, 2000. “Interpreting Cuba’s External Accounts.” Cuba in Transition—Volume 10. Association for the Study of the Cuban Economy, Washington, D.C.
Locay, Luis, 1998. “Toward a Market Economy or Tinkering with Socialism,” in Pérez-López and Travieso-Díaz (eds.) Perspectives on Cuban Economic Reforms. Tempe: Arizona State University Press. Pérez-López, Jorge F., 2000. “Cuba’s Balance of Payments Statistics.” Cuba in Transition Volume— 10. Association for the Study of the Cuban Economy, Washington, D.C.
1. I would like to thank Roger Betancourt for comments on an earlier draft of this paper. 2. If the only source of dollars used in dollar stores were remittances, transactions at such stores would underestimate remittances. Remittances can also go to increase holdings of dollars, which could be substantial in an economy with a growing black market financed at least in part by dollars. The fees the government charges for sending funds to Cuba would also not appear as dollar sales. 3. This would ignore Cubans living outside of Cuba and the United States, but results from the U.S. could be extrapolated for other countries to at least obtain an upper bound. 4. The elasticity of demand for goods from dollar stores here is -1. It is well known that for an interior solution when marginal costs are positive requires demand to be elastic. 5. This does not mean that remittances make up the bulk, or even a major part, of Cuban income. The Cuban-American relative determines the marginal dollar received by his relative in Cuba, so he determines the Cuban’s precise income or consumption level. 6. It is important, however, that those who receive remittances not be exactly the same people who have other sources of dollars. That is, the two groups can overlap, but cannot be identical. 7. The primary restriction this utility function imposes is that there are no income effects in the demand for remittances. That is, changes in the income of Cuban-Americans have no effect on the amount remitted. Obviously this would not be a suitable utility function if that were the focus of this paper. 8. It is not clear that the detrimental effect on support from remittances, az should be weighted simply by the fraction of people receiving remittances. I do not explore the possibilities here, since I do nothing with the relative sizes of the various groups. 9. Keep in mind that this figure is per person. A single person in a family of four with informal dollar income, for example, would have to earn $1800 a year for each member of the family to have a per capita dollar income of $450. 10. Again, this is a per capita figure. It would be higher per worker.